Some stuff, what's stuff anyway. Never mind. Some of you may receive this magazine and have read it. But for those who have not I suggest you pick up a copy of the March/April American Angler. 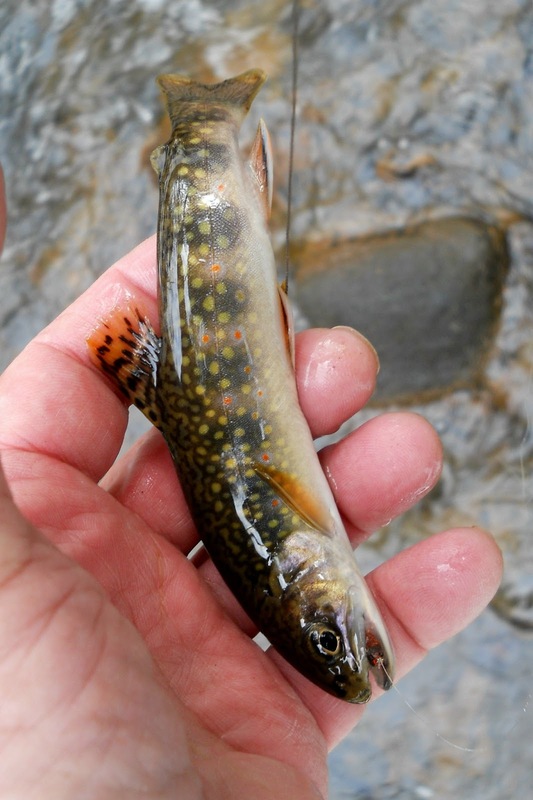 In it you will find a wonderful article by Steve Culton about small stream fishing for wild brook trout. Steve lives in Connecticut and has logged many miles of small streams in search of these natives. If you have an interest in fishing for these guys, this article can help you a lot. One of these days I may have to hook up with Steve and pick his brain. Steve's site is, " currentseams.wordpress"
We also fished for a few hours yesterday. I'll give a report on it in a few days. 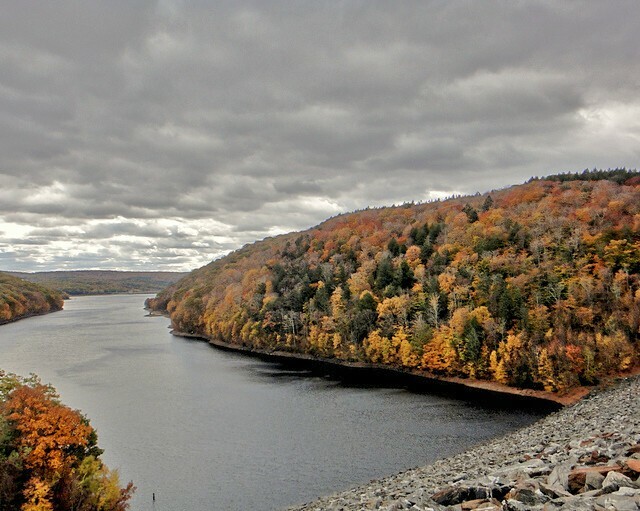 The West Branch Reservoir also known as "Hogback" is located in northwest Connecticut. It was built about 1955 and is a deep cold water lake. One of its residents is the rainbow smelt, and where this little fish swims there are many who find him to their liking, including brown trout. This reservoir was the inspiration for this streamer. 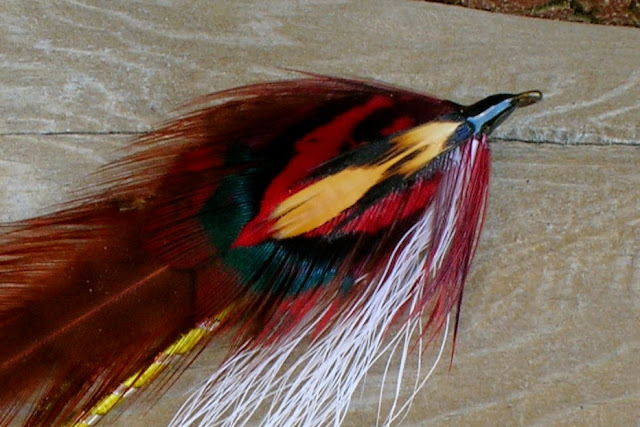 "Hogsback" is tied with natural grizzly hackle. This not only produces the smelt color, but also has that thin smelt profile. This streamer is called "Tanic". The name was given to this fly for the tannin stained waters of the northeast. The woods. Featured are the ever present hemlock, the oak and maple, trees so strong they have probably stood for years. Within this forest lies a stream. The stream too has been here for years. It continues is never ending run to the river and eventually the sea. Its waters flow over wood and stone, at times so swift one would wonder how anything could survive. At times when the rains don't come its water are at a scant trickle again making one wonder. As you approach you can see water, water so protected it would be difficult for a natural insect to fall in, let alone an angler trying to cast a fly. Upon further exploration you come upon a part of the stream that widens a bit, and creates a deep slow run. Observing closely you see the rise of a brook trout. Looking about you cannot see a bug anywhere. A moment or two later another rise. Your equipped with a small caddis, perhaps it's enough to fool the brookie. Taking time to present the fly just right you send it on its way. The caddis floats close to where the fish is holding. The fly drifts by with no response. Working the fly back you see movement, thinking the water will erupt soon, but it doesn't. You attempt to cast again and as the fly hits the water the brookie rises and takes. A hookup, ever so short, but a success. You have at this point failed to bring another fish to the fly. The stream is changing and you find a deep dark very fishy looking spot. A small plunge pool with water flowing up close to a large rock. The water is the color of dark tea. 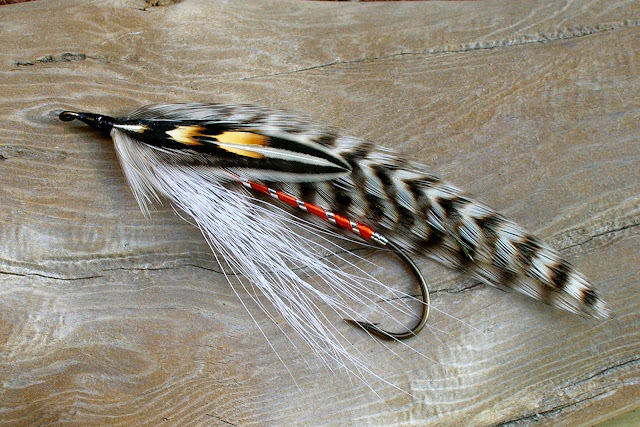 You have tied on a stimulator a fly that has a reputation for catching the eye of brook trout. You feed the fly through the plunge pool, the water takes it under. The fly pops up and starts its drift towards the rock. Suddenly like a grouse flushing, the brookie rises takes the fly and vanishes into the dark water. Lifting the small 2wt up you feel the brookie. He fights as best he can, eventually loosing the bout. As you admire this wild gem in your hand, you say what can be more beautiful. Letting him slip back into his dark home you hope that these woods and the stream they protect shall endure. 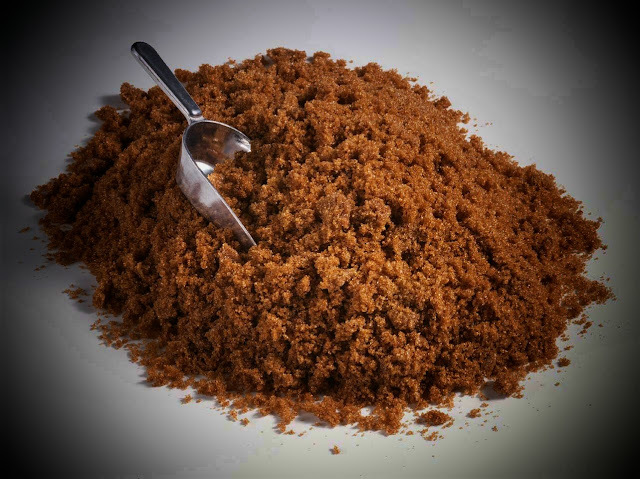 Brown sugar is that wonderful sweet product we put in our oatmeal, chocolate chip cookies, baked beans and lots of other things. Brown sugar was not always the best choice for sweeteners at one time. But as we learned more about it we changed our ways and accepted it as part of America. So the same can be said about the brown trout. He is not native to America, but has gained a wide and profound following among anglers. He is wily and very selective. And he is quite the bulldog when hooked. We have many streams in Connecticut that have wild self sustaining brown trout populations, and I enjoy targeting these fellows at all times of the year. A wild brown can be taken on all types of flies. They're love of meat makes them a fine choice for streamers. My choice of flies for this handsome guy is the dry fly. While brookies will smash a surface offering, the brown seems to rise and look, then take the fly with resolve and if hooked give a fine accounting for himself. So if given the chance to fish for sweet brown sugar, I'll take it. Broccoli and sausage bread. This is an Italian delight. It's made with broccoli thats been sauteed in olive oil with garlic, crushed red pepper, salt and hot Italian sausage. The sausage should be "Lamberti's", if not of your own making. Fresh dough is rolled out and the mixture is placed on it. Then fresh sliced Parmigiano Reggiano is put on top of mixture. The dough is folded over and sealed. A few slits are made on top. The bread is placed on a sheet pan that has dusted with cornmeal. Put into a 375 oven and baked for about 35 to 45 minutes. I make them in two sizes, large family style, and smaller "sangwich" style. I enjoy a piece with a hot cup of coffee. "Mangia bene"
Yesterday was my first time fishing since the "Nemo" the blzzard. I found the stream to be closely guarded by deep snow. Walking was hard, struggling through knee deep snow. And not knowing where the stream started and the snow ended proved to be a challenge. The air temp was a delightful 40 plus, with bright sunshine sun glasses were a must. I had tied on a dry fly in an attempt to get my February trout on the dry. I fished this way for most of the time. I thought I had a good chance of hooking up considering the amount of little black stoneflys I observed on the snow. With out any interest paid to my dry flies, and my time getting short, I tied on a wet fly. Fishing selected locations I finally managed to get a taker. A wild jewel to hand. I fish dry flies most of the time, especially on the small streams. Most of these flies are tied with lots of hackle and are designed to stay floating in faster runs and pockets. These are generic flies and can represent most insects found on these waters. But there are those times when a stream will produce a hatch of pretty little mayflys. 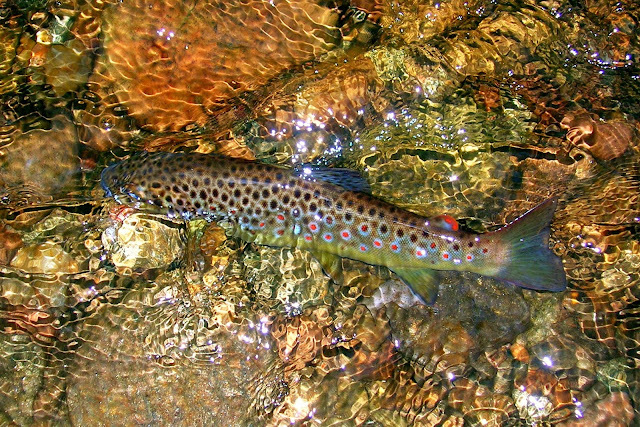 While these hatches are far and few the trout have them in their memory. That's when the Catskill dry fly comes into play. I have been attempting to tie these delicate beautiful flies. 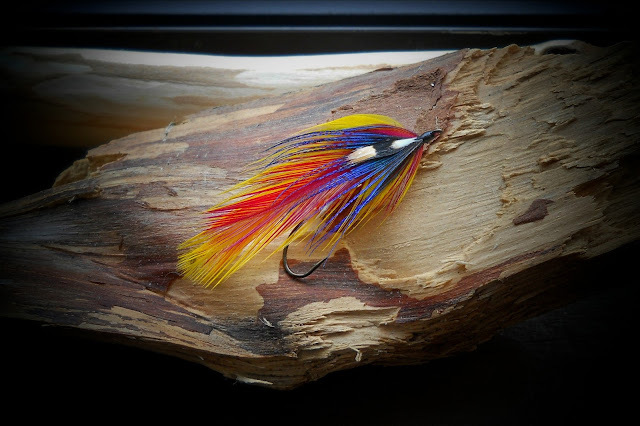 Catskill patterns are usually crisp, and are tied to be floated on those smooth slick pools, but I have fished them in most streams in various types of water. Below I have tried to capture the Catskill style. 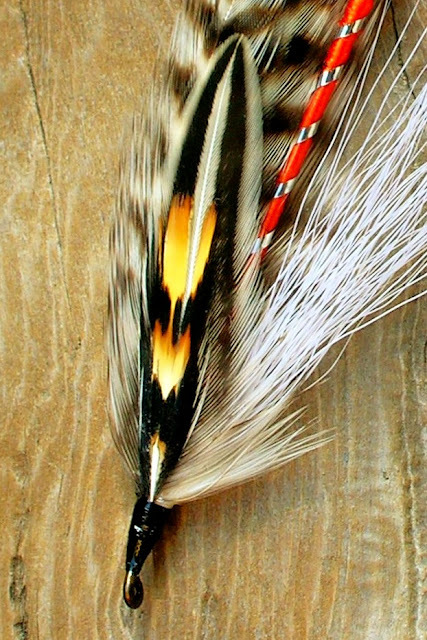 The fly on the left was tied in the Catskills and purchased from the fly shop above. The fly on the right is my attempt to match the style. The fly on the left Catskill, and the one on the right is mine. In this day with ever changing fly patterns and materials, it's nice to tie and fish the old stuff. Bemis is located at the far end of Mooselookmeguntic Lake. It's an area that is quite special both from a angling perspective as well as a natural one. The stream is accessed from an old road that is still mostly dirt, and at certain times the ruts can make you feel your driving in mini canyons. The woods are teaming with wildlife, and deer, and moose are seen at any time. Early mornings loons can be heard, there sound is of a wilderness they inhabit. There are areas just to the left of the lake that have not been changed and remain like they were when man first saw them. And from what I'm told they will be protected forever. There is a stream that flows into Mooselookmeguntic lake. This stream is Bemis Stream. It's a stream that provides spawning habitat for the brook trout that live in the lake. In the fall there are places where one can fish a streamer and have the possibility of taking a four pound plus wild brook trout. The section of AT that crosses here is one of the most rugged. The beauty that surrounds it is worth the trek. A streamer I created. It captures my feeling for the woods, waters, solitude and the beauty of Bemis. 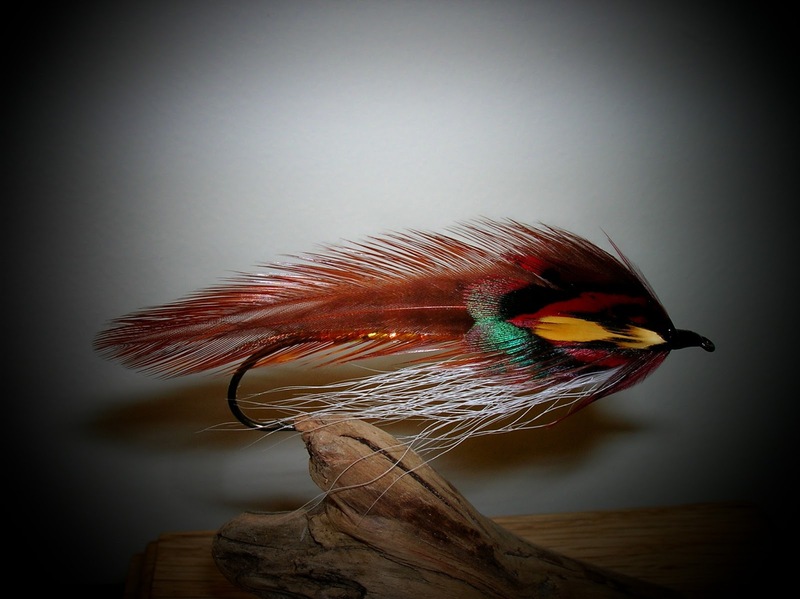 "Bemis Special"....Tied in the Rangeley style. My garage is around here somewhere. Here's a couple of pics from this AM. The snow is up to my windows. I estimate I have 25 inches of snow, and higher drifts. Had some birds pay a visit. I'll get out soon, hopefully and get some seed down. With the impending blizzard I thought I would put together some food for comfort. The first dish is a favorite, "potato gnocchi". This pasta is made with wheat flour and potato. It's first gently boiled, and when it floats to the top its removed and drained. In a skillet some butter is melted along with olive oil. Then some sage is added along with onion, salt and crushed red pepper. The gnocchi is added and allowed to cook until the edges begin to brown. Then fresh parsley is added. You can grate some pecorino on top, then serve. Chicken Soup. It does warm those places a steak can't reach. I make enough for at least 3 meals, and by the last one it's perfect. With talk of an impending nor'easter that's on tract to dump a couple feet of snow on us Friday, I took the opportunity to fish yesterday. The first stream I selected was a bust. That is I busted it. access was very difficult and when I was able to drop a fly every wild trout was already in the next county. So I moved to stream two. It was in wonderful shape. Nice flow, clear water, and the sun was on the water to help warm things up, especially my bones. As I moved into position for my first cast I noticed lots of caddis, both cased and uncased. I had a small worm like pattern that was close to it as far as shape gos, but the color was different. So I cast the fly upstream a bit and on the second cast I had a hit. Good start...not. I fished that fly for at least 45 minutes without a bump. By this time I had moved to a section where the stream flattens out and is much slower. Soon the fly was to produce. As I lay my hand into the water to lift the little fish up, what I thought was a brown, seemed a bit odd. It had a stout that was long, somewhat like a pickerel. I took a photo, and it flipped itself free and swam off. Sorry for the poor quality, but he did not give me a second chance. I moved downstream to an area I call the cow pasture. It's a section of stream that flows by a long pasture. It also has a nice feeder brook coming in. As in times past it proved to be a good spot to fish this day. The fly stopped its drift just past the brook. I lifted the rod and soon this wild jewel was at hand. I would like to mention a book that I have really admired. It's essays are wonderful. They tell of real everyday regular outdoors people, told as only Tom Hennessey can. With the nor'easter a coming, I'll read from this book again. A few streamers will be tied also....a Name "The Blizzard"